← Which Rangers are primed for a breakout season? Despite falling short in recent playoff runs, the Rangers future is very bright, and their chances at winning a Cup are far from done. Photo courtesy of Getty Images. With each passing day, the Rangers get one day older. With each passing year that the Stanley Cup is hoisted by another team, the Rangers lose a year of hard work, and miss out on reclaiming the greatest trophy in all of sports. Everyone mentions the “window” that the Rangers and Henrik Lundqvist have in order to raise another championship banner in MSG within the next few years. A lot of people claim that in order to win, the Rangers have only a year or two before it all falls apart. This past season marked the fifth consecutive year that the Rangers have made the playoffs, with at least one series win in the last four years. They’ve made it to the Eastern Conference Finals three times since 2012, as well as advancing to the Stanley Cup Finals for the first time in 20 years in 2014. There have been a lot of great memories over the past four years, but if Captain Ryan McDonagh does not lift the cup at least once, is all of the success for naught? Obviously, the main goal for every team coming into the season is to win the Stanley Cup. The Rangers are no different from the other 29 teams in the league, and they’ve been very close on quite a few occasions. And I’d rather have all of these thrilling Cup runs instead of the miserable years that fans of teams like the Buffalo Sabres and Edmonton Oilers had to sit through. And contrary to popular belief, the team’s best years are not behind them. First and foremost, let’s tackle the “age issue” that many people claim the Rangers have. The Rangers are not an old, aging team full of veterans and no hope for the future. Most of their roster is full of players in their mid to late 20s. In fact, Alain Vigneault will only field three starters over the age of 31, with those players being Dominic Moore, Dan Boyle and Henrik Lundqvist. Only six starters will be 30 or older (Kevin Klein, 30, Rick Nash, 31, Dan Girardi, 31, Henrik Lundqvist, 33, Dominic Moore, 35, Dan Boyle, 39). Even when looking at some of these “old” players, the majority of them are coming off of great seasons! Dominic Moore tallied 10 goals and 27 points for the first time since the 2010-11 season with the Lightning. Kevin Klein had the best offensive season of his career, scoring nine times (four game winners), and totaling 26 points. Rick Nash just set a career high for goals in a season, finding the back of the net 42 times. And if it wasn’t for the injury, Henrik Lundqvist probably would have broken the 40 win mark for the first time in his career. 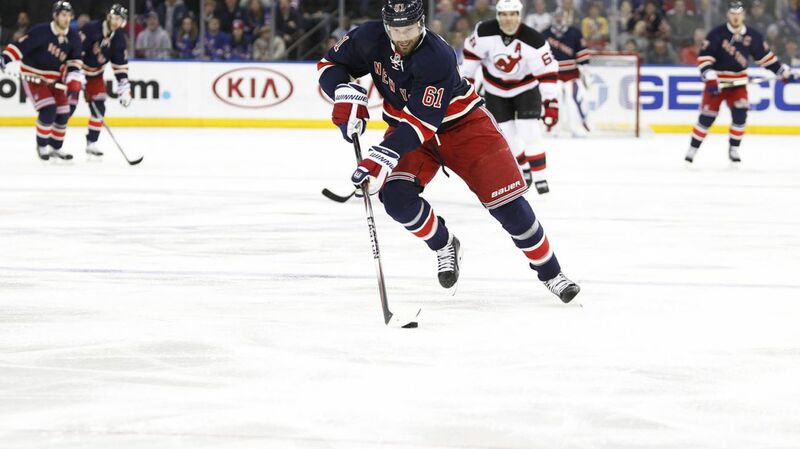 Rick Nash, one of the “older” players on the team, scored a career high 42 goals this past season. He’s one of veteran players still performing very well for Vigneault. Photo courtesy of MSG Photos. So whatever people may say about the Rangers’ age, it’s not true. Most of them are in their early 30s, and still playing damn good hockey. When you look at the rest of the roster, Jeff Gorton has assembled a team full of players that are either; A) Young and improving, or B) About to enter the prime of their careers. Look at Derick Brassard, for example. The 27 year old, former sixth overall pick in the 2006 NHL entry draft is coming off of the best season of his career. He set new career highs in goals (19), assists (41) and points (60). With the talent around him, and newfound confidence, Brassard is at that part of his career where he really begins to play his best hockey, starting with this past season. He’s still getting better and learning, which is scary considering how good he was last season. Some other players are like that too. Brassard’s linemate Mats Zuccarelo turned 27 this year, and he too is starting to play the best hockey of his career. His 59 point season in 2014 was impressive, and he followed that up with a 49 point season this year. If he’s fully healthy, the two of them could wreak havoc alongside Rick Nash. Derick Brassard and Mats Zuccarello, both 27, are playing the best hockey of their careers, and they’ll look to improve as they enter their prime. Photo courtesy of MSG Photos. Keith Yandle is the premier offensive defenseman on the Rangers’ roster, and he’s only 28 years old, also in the prime of his career. Yandle split the 2014-15 season with the Coyotes and Rangers, finishing the year with six goals and 46 assists for 52 points. He added another two goals and nine assists in the playoffs. The Rangers haven’t had an elite, power play specialist and puck moving defenseman on the blue line for quite some time. Coming off of back-to-back 50 point seasons, he too should be a force in the Rangers lineup. And then we get to all of the youth talent Alain Vigneault has at his disposal. Derek Stepan, 25, just inked a six year, $6.5 million contract, keeping him on Broadway through the prime years of his career. Stepan finished with 55 points (16-39-55), the second highest total of his career despite missing 14 games due to a broken leg. He’s one of the players that continues to get better as each season goes by. If he stay’s healthy, I’d wouldn’t be surprised to see a 65 point season out of him, or maybe even better. Chris Kreider, despite his inconsistencies, is one of the premier power forwards in the entire league. While his stature is threatening enough, it’s even more terrifying for a defender to see him flying down the wing at full force. At his top speed, he’s still able to deke out goalies and hold off his defenders. A 30 goal season is definitely in his future one day. The question is when that will be. Oh, and he’s also 24 years old with three lengthy playoff runs under his belt. 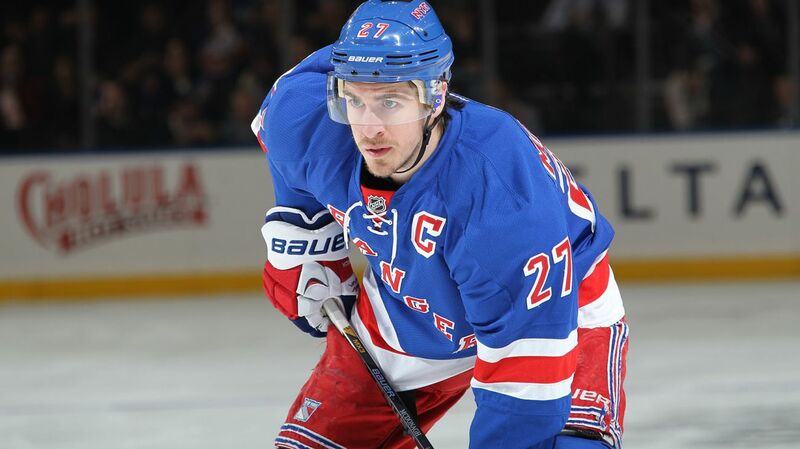 Even the captain, Ryan McDonagh, still has his best years ahead of him. McDonagh’s just 26 years old, coming off of a season that saw him deal with a broken foot in the playoffs, and learning the responsibilities of being captain. I’m sure you all remember his 14 goal, 43 point season in 2013-14, when he established himself as a top defender in the league. He can shut down the best of players in the league, and he’s got the ability to break out with a 50 point season eventually. Ryan McDonagh had some struggles last year, learning the responsibilities of captain and dealing with injuries in the regular season and playoffs. But the ultra-talented defenseman is just 26 years old, and with a lot of experience under his belt, he’ll be well prepared for next season. Photo courtesy of MSG Photos. Then you have guys like Jesper Fast, Emerson Etem, JT Miller, Oscar Lindberg and perhaps the most talented youngster, Kevin Hayes. None of the players listed are over the age of 23, and all of them have a lot of upside. Kevin Hayes totaled 45 points (17-28-45) in a very impressive rookie campaign last season. JT Miller finally earned a spot in the starting lineup, capping off the year with a four point night in Game 6 against the Lightning. Jesper Fast is already one of the top defensive players on the Rangers, and he too has shown some promise when it comes to his offensive game. Oscar Lindberg (28 goals last year with Hartford) looks like he will get a shot at making the team out of training camp. And the former 60 goal, 100 point scorer in junior hockey, also known as Emerson Etem, will get his first chance to be a top-nine player in the NHL. If that doesn’t give you hope and reassurance for the coming years, then I don’t know what will. 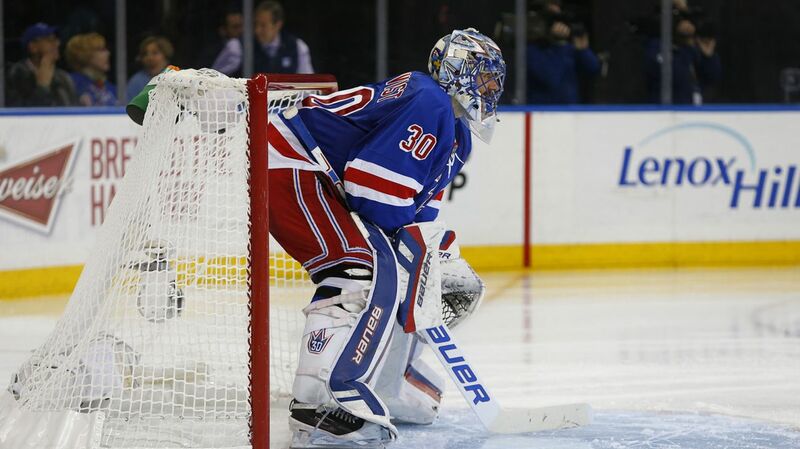 And lastly, let’s revisit one of the best goalies to grace the crease for the Rangers, Henrik Lundqvist. He is probably the most dedicated, hardest-working players that you will find in the entire league. Just take a look at this article from Fox Sports about his work ethic and mentality when it comes to hockey. Henrik Lundqvist will turn 34 in March. Many people say that he is in the last few good years of his career. I say that’s totally wrong. Martin Brodeur is one of the best goalies in NHL history. He holds the record for most wins (691) and most shutouts (125), and he’s won three Stanley Cups, all with the New Jersey Devils. He almost won a fourth time, and that was in 2012, when the Devils beat the Rangers to advance to the Stanley Cup Finals, falling to the Los Angeles Kings in six games. That year, Brodeur was 40 years old, and still playing well. I think that with his work ethic, and his talent, Lundqvist can also be a really good goalie in the later stages of his career. He’s the kind of player that can keep himself in shape and in top form until his late 30s, not unlike Brodeur. He’s got at least five strong years ahead of him, at least. Henrik Lundqvist is not entering the end of his useful years in the NHL. If I had to guess, he’ll be effective for at least the next five years. Photo courtesy of MSG Photos. With Jeff Gorton at the helm, there is no reason to panic or believe that the Rangers window has closed, and it’s not fast approaching either. Their “old” guys are still playing great hockey, there is a lot of young talent with loads of upside on the roster, and a few guys ready to enter their prime. Posted on August 6, 2015, in In the Crease and tagged Chris Kreider, Derek Stepan, Derick Brassard, Emerson Etem, Henrik Lundqvist, JT Miller, Kevin Hayes, King Henrik, Lundqvist, Madison Square Garden, Mats Zuccarello, MSG, New York Rangers, New York Rangers blog, NYR, Rangers, Rangers blog, Rangers Stanley Cup, Rangers window closing, Ryan McDonagh. Bookmark the permalink. 1 Comment. You make very valid points. As a die hard fan I hope you are right. But history shows us teams that repeatedly get close and don’t win it all, usually don’t. We have a great goalie and blue line. We have very good, but no elite, no leaders up front. Neither one of our top two centers can win a face off. Nash repeatedly disappears in the playoffs. Our best forward in the playoffs the past few years has been Kreider. No veteran forward has stepped up. A forward has to step up to lead this team to the CUP. Who will it be?